Cynical Existence is a project from lead vocalist Frederick Corona of the aggrotech/industrial act Project Rotten and vocalist of dark electro/industrial act Menschdefekt and Cryon from Greek act Pre Emptive Strike 0.1. 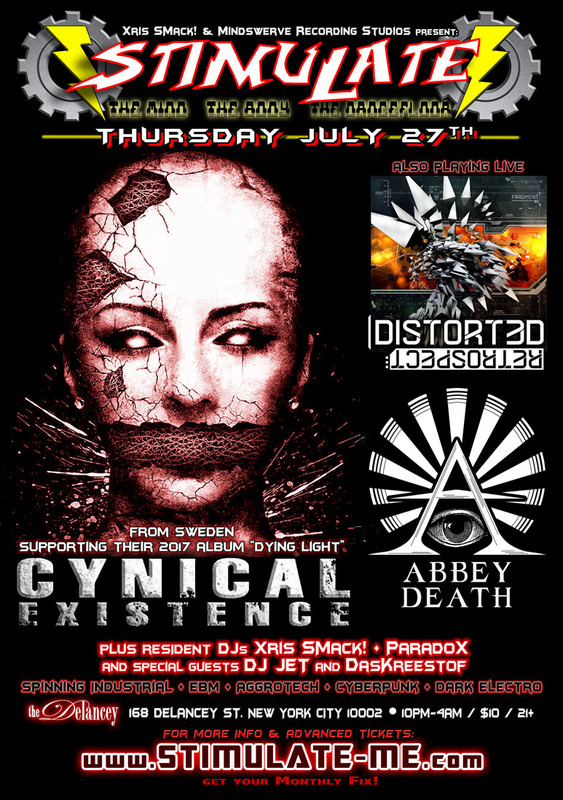 Beginning in 2011, and through 4 albums and 8 Singles & E.P.’s, Cynical Existence is always evolving and moving forward, experimenting with different genres while staying true to their aggrotech roots. With 2017’s “Dying Light” the band strives to reach new heights with a combination of raw and angry guitars that meet catchy melodies”. Krztov (live member of Velvet Acid Christ) creates Dark Electronic / Industrial with Distorted Restrospect and has toured the U.S.A and Canada, including gigs with Architect (Daniel Myer of Haujobb), Velvet acid Christ, Panic Lift, Stoneburner (Steven Archer of Ego Likenesss) and Front 242. Abbey Nex (Combichrist, Psyclon Nine and The Genitorturers) are known for their energetic performances internationally, and are taking on the goth industrial world themselves in their project Abbey Death. Their debut record “Realignment” shows off their efforts in a dark revival in their music and themselves as artists. Playing Live shows with Kite, FGFC820, interface and more. a band to watch for! Ashley Bad, BlackLite Bonnie, Vasa Pixie, Venus Pain, Megan Minya, Harry Lucien Lightbringer, and more! :ABBEY DEATH, Abbey Nex, Cynical Existence, Distorted Retrospect, DJ Jet, DJ Paradox, Valerie Abbey, Valerie gentile, Vampire Freaks, Xris SMack!